There are benefits to playing games. Believe it or not, games are healthy for your children. Playing encourages family time, patience, teamwork, and good sportsmanship. Regular board games become boring after some time. It’s time to spruce things up for family game night! Set aside your cards and spinners (well maybe not all of them). And take out the dice! 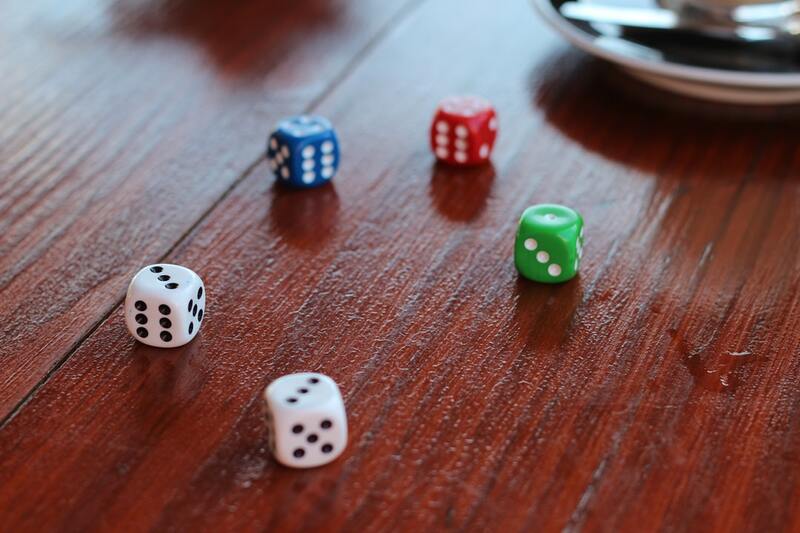 If you’re ready to switch things up, then these family dice games are your answer! We’ve listed the top 10 best dice games. Some are considered easy dice games. And others are a little more challenging. Take a look at these old and new dice games that are sure to have the whole family playing! First on the list is Rory’s Story Cubes! It’s a good dice game to get those little minds thinking! And it’s ideal for the youngsters who love being creative. Players take turns rolling the dice. There are 9 dice and each one has 6 different pictures on it. Roll the dice and see which 9 images you get! You then have to use these different creatures, items, or expressions to create a story of your own! The little ones will have a blast coming up with unique stories to tell. Here’s a classic. New dice games can’t compare! You’ll be brought back to your own childhood with this popular dice game. Bring out the box! And show your kids your Yahtzee skills! They’ll have a blast shaking up the dice inside the cup. It takes strategy and a little bit of chance. You’ll need to roll specific combinations for each category and rack up the points. But remember, if you roll 5 of the same number it’s Yahtzee! This is one of the best quick dice games on the shelf! But hurry, because it happens in a flash! Players use math skills and quick reflexes to win the game. There are 8 challenges that each player must complete. Players compete to finish all 8 challenges first! But you’ll have to think fast and move fast with this one. This dice game is all about the dice. It’s centered around 36 dice! And don’t hesitate to find out more about other integral dice games! This dice game is really turning heads left and right! Each player starts out with the same amount of chips. Then, they take turns rolling the dice. The three dice are labeled “L”, “C”, and “R”. Each one also has a dot on one side. For each “R” you roll, you pass a chip to the player on your right. Each “L” you roll, you pass a chip to the left. And “C” means you put a chip in the center. If you roll a dot, then you don’t give any chips away for that one. The player who is the last one left with chips wins! It gets pretty intense. So get ready! Quixx is a great dice game to help the little ones practice their math skills. But you have to be Quixx! This fast-paced game will have you racing to rack up the points. There are 2 white dice and 4 colored dice. Players roll all six dice on their turn. Then they add the sum of one white and one color together on the corresponding color’s row. The other players add up the sum of the two white dice. The player with the highest score wins! But make sure to add a score in every section, before you get locked out of a color’s row! Farkle is a dice game of luck! Every turn you get, you push your luck. And scorekeeping is a must. Each player rolls six dice on their turn. And depending on the version, you score points for different combinations. Once a winning combination is rolled, the player can choose to roll again. But if you roll again and lose, then you’ll risk it all! Dicecapades is filled with a variety of dice games! There’s something for everyone in the family. With so many different games to choose from, you can’t go wrong with this pick. There’s trivia. There are draw challenges. And there are also physical challenges! So get up and start moving around! You should loosen up for this one. And the best part about it is the adaptable rules! Knockout is another dice game requiring a few math skills. It’s a great way for kids to learn or freshen up on their math knowledge. Grab two dice and a dry erase board and you’re good to go! Write the numbers 2-12 on both sides of the board. The two players will sit on either side. When it’s your turn to roll the dice, add the sum of the two together. Find that sum on your side of the board and erase it. The first player to erase all their numbers wins! It’s fast and fun and a great learning experience! UNO Dice is the classic we all know and love, but in dice form! This dice form of the beloved game is for two players only. And it’s perfect for on the go! Rules are still similar to the UNO cards game. And it’s face paced! Players roll dice trying to match the dice in the line as you would with the cards. And the player to rid themselves of all their dice first wins! UNO! There are multiple ways to play Tenzi! Each player gets 10 dice of their own to roll. Everyone rolls their dice at the same time. Once the dice are rolled, each player picks one number to try to get all dice on. Players continue rolling until every dice is on the same number for a win! However, there are a plethora of ways to play the game! Pick a version that the whole family likes best! These family dice games are destined to bring the family together. Push the boring board games to the side! And roll the dice! Playing will teach everyone patience, speed, math, and sportsmanship! And spending the evening inside is a great way to have cheap fun! For more information on ways to enjoy life without spending big, take a look at our blog!